Aim: The aim of this study was to examine the impact of thermocycling on the flexural strength and development of surface flaws on the glazed surface of porcelain laminate veneer restorations with and without resin luting cement. Materials and Methods: 80 Vitadur alpha dentin porcelain discs (10 mm diameter, 0.9 mm thickness) were glazed on one side and divided into two groups: A (porcelain laminate veneer only without resin luting cement) and B (porcelain laminate veneer luted with resin cement), each containing 40 discs. The discs in groups A and B were then thermocycled at different temperatures and were subjected to SEM analysis to evaluate the effect of thermocycling on crack propagation. Mean flexural strength was determined by using the ball-on-ring test. Student's t -test was used to find out the difference between strength values of the thermocycled porcelain discs and discs luted with resin cement. Results: SEM analysis revealed crack propagation in the subgroups subjected to extremes of temperature, i.e., 4 ± 1°C, 37 ± 1°C and 4 ± 1°C, 65 ± 1°C in the porcelain laminate veneers luted with resin cement. Flexural strength analysis revealed superior flexural strength for porcelain laminate veneers: 88.58 ± 6.94 Mpa when compared to porcelain laminate veneers luted with resin cement: 8.42 ± 2.60 MPa. Results were tabulated and statistically analyzed using Student's t -test. Conclusion: Laminate veneer specimens exhibited greater flexural strength than those which were luted with resin cements. Laminate veneer specimens luted with resin cement and subjected to extremes of temperature, 4 ± 1°C and 37 ± 1°C and 4 ± 1°C and 65 ± 1°C, showed a marked decrease in flexural strength. After thermocycling at extremes of temperature, laminate veneer specimens luted with resin cement showed crack propagation. Fit of laminate veneers cannot / should not be compensated by the thickness of luting agent. Keywords: Flexural strength; porcelain laminate veneers; thermocycling. The clinical failure of porcelain laminate veneer restorations was due to the development of flaws on the glazed surface of the restorations. Postoperative cracking and failure of the restorations can occur as a consequence of thermal variations that these restorations are likely to encounter in service. Furthermore, the resin cement used for luting the laminate veneer may impose surface changes on the veneer when it is subjected to thermocycling. To examine the impact of thermocycling on the development of surface flaws on the glazed surface of the restoration using scanning electron microscopy. To evaluate the biaxial flexural strength of porcelain laminate veneers with and without resin luting cement after being subjected to thermocycling. Eighty test specimens were fabricated in the form of discs of 10 mm diameter and 0.9 mm thickness using about 0.6 g of the Vitadur alpha dentine powder, preweighed in an electronic balance, and 0.22 mL of the modeling fluid measured with a micropipette. The ceramic powder was mixed with modeling fluid, placed in the metallic mold, and compacted. The discs were then fired in a Multimat vacuum furnace (Mach 2 Dentsply), according to the manufacturer's instructions [Table 1]. The specimens were verified for dimensions using a micrometer. Heatless green carbide stones and emery discs were used to reduce the ceramic thickness. Specimens were divided into two groups of 40 specimens each, i.e ., Group A: only porcelain laminate veneer without resin luting cement , and Group B: laminate veneer luted with resin cement . Group A test specimens were prepared as mentioned above whereas group B specimens had resin cement luted with the laminate veneers. First, discs of 0.9 mm thickness and 10 mm diameter were prepared. The unglazed surfaces of the discs were then etched with 5% hydrofluoric acid for 60 seconds. The etched surface was then washed thoroughly with water and luted to dual cure resin cement standardized to a thickness of 0.2 mm with the help of a metallic shim. Thermocycling was done for both A and B groups. Each group had consisted of four subgroups of ten specimens each. The sample specimens of each subgroup were thermocycled as indicated above, between the maximum and minimum temperatures that the mouth is subjected to: 65 ± 1°C and 4 ± 1°C respectively, and the closed mouth temperature, 37 ± 1°C. Samples were carried in a mesh tray embedded in silicone putty impression material to expose only the glazed surfaces. The control group of samples belonging to subgroup (i) of groups A and B was submerged in a water bath maintained at 37 ± 1°C for the time equivalent to that required for 3500 cycles(equivalent to one year). The mesh trays with the samples from the other three subgroups of groups A and B were submerged in the respective water baths (corresponding to the indicating temperatures) for a constant length of time (five seconds). The thermocycling unit was custom fabricated and consisted of a thermocouple and a heating element. A temperature sensor kept in the water bath was connected to a digital display unit. The digital display unit had a set button through which the temperature could be accurately set to ± 1°. When the water bath attains the desired temperature, the thermocouple automatically cuts off the power supply, thereby maintaining the set temperature. Temperatures of 37 ± 1°C and 65 ± 1°C were set with this unit. A temperature of 4 ± 1°C was maintained with an ice pack containing crushed ice and the temperature was measured with a thermometer. The frequency of the thermocycling regime proposed in this study was based on the assumption that a maximum of ten extreme thermocycling cycles would occur per day. As a result, the 3500 cycles chosen would represent approximately one year of service for a porcelain laminate veneer restoration. Each specimen in subgroups (i), (ii), (iii), and (iv) of both groups A and B were subjected to scanning electron microscopy analysis after they had been thermocycled. The specimens were prepared by platinum sputtering and analyzed using ×100 magnification. The ball-on-ring test was employed to assess the fracture strength of the surface-finished specimens. The test was performed using a Universal testing machine ( Instron ) with a loading ring apparatus at the displacement rate of 1.0 mm/min. Student's t -test was used to determine the difference between strength values of the thermocycled porcelain discs as well as discs luted with resin cement and that of the control groups. Eighty Vitadur alpha dentin discs were fabricated and divided into two groups: A consisting of only ceramic veneer discs and B consisting of ceramic veneer luted with resin cement. Each group was then divided into four subgroups based on the temperatures that they were subjected to during thermocycling. Breaking load values were obtained and flexural strength was calculated as shown in [Table 2] and [Table 3]. [Table 2] shows the flexural strength of group A samples wherein it was found that subgroup (i) had superior flexural strength followed by subgroups (iii), (ii), and (iv). [Table 3] shows the flexural strength of group B samples wherein it was again found that subgroup (i) had superior flexural strength followed by subgroups (iii), (iv), and (ii). SEM analysis was performed to evaluate the effect of thermocycling on crack propagation. Scanning electron microscopic analysis showed no significant findings in Group A specimens whereas the sub groups (ii) & (iv) of Group B specimens revealed cracks propagating through the ceramic veneer as shown in [Figure 1] and [Figure 2]. The results are tabulated and statistically analyzed using Student's t -test. The overall mean and mean values in all four subgroups' of flexural strength group A were significantly higher than the corresponding mean values in group B as shown in Graph 1- [Additional file 1] and [Table 4] and [Table 5]. Brittle materials such as ceramics fail because of the formation and growth of microscopic flaws that can form during the fabrication or service of these ceramics. ,, Ceramics are susceptible to slow crack growth at the tips of the surface flaws exposed to a moist environment as a result of hydrolysis of the silicate bonds. Studies by White et al . have shown that immersion of ceramics in water decreased their static strength and increased the crack velocity. Sherill and O'Brien,  Fairhurst et al.,  and Myers et al . had demonstrated a decrease in flexural strength of aluminous and feldspathic porcelains when these were tested in water. Furthermore, surface flaws may become extended due to thermal variations induced by ingested foods and drinks. As attributed by Fleming et al. ,  porcelain laminate veneers which are of only 0.5-0.9 mm thickness, may fail clinically due to the flaws extended as a result of thermal variations. Therefore, we sought to evaluate the effect of thermocycling on the flexural strength of the laminate veneers by themselves and when luted with resin cement. Disc specimens were fabricated for the study to avoid the effect of flaws associated with rectangular bars. The surfaces of the discs were glazed to increase the strength by inhibiting crack propagation through the compressive stresses generated on the surface of the ceramic during cooling. Studies by Chu et al . had proved that self-glazing was the most appropriate procedure to be carried out to control surface flaws in porcelain restorations if firing conditions were controlled properly. Porosity affects crack propagation behavior of ceramics. Furthermore, Anusavice et al . pointed out that irregular, nonspherical voids and not spherical voids facilitated crack initiation. Our study samples had spherical voids, and hence, it can be reasonably deducted that these voids have not affected the strength property of the material. The thermocycling regimen was carried out between the maximal and minimal temperatures, i.e ., 65 ± 1°C and 5 ± 1°C with the closed mouth temperature, 37 ± 1°C, being selected for the control subgroup. This is in accordance with the study by Palmer,  who showed that the maximal and minimal temperature extremes in an oral cavity ranged between 0°C and 65°C. Three thousand five hundred cycles was the number of thermocycles chosen to approximate one year of clinical service for a porcelain laminate veneer restoration,  assuming that a maximum of ten extreme thermocycles would occur a day with a short dwell time of five seconds. After subjecting the samples to thermocycling, they were subjected to scanning electron microscopy which revealed crack propagation in the samples of group B, wherein ceramic discs were luted to resin cement and subjected to temperatures of 5 ± 1°C and 37 ± 1°C (subgroup (ii)) and 5 ± 1°C and 65 ± 1°C (subgroup (iv)). As demonstrated by Magne et al. ,  the occurrence of cracks was due to thermal variation that generated a cyclic mechanical load that resulted from the differential thermal expansion of the luting agent and the ceramic veneer. The co-efficients of thermal expansion of the luting agent and the porcelain veneer are 30°C×10 -6 and 8°C×10 -6 respectively. The flexural strength analysis revealed decreased strength of specimens of both groups A and B that had been subjected to extremes of temperature. This showed that lower temperatures had a deteoriating effect on the flexural strength of laminate veneers and laminate veneers luted with resin cement. Between the two groups, group B ( laminate veneers luted with resin cement ) specimens showed a marked decrease in flexural strength than those of group A ( laminate veneers only ). Among the specimens in group B, those that had been subjected to extremes of temperature, 4 ± 1°C and 37 ± 1°C and 4 ± 1°C and 65 ± 1°C, showed a decrease in their flexural strength. Water played the role of plasticizer, seeping into the resin cement and decreasing the elastic modulus of the resin. Laminate veneer specimens exhibited greater flexural strength than those which were luted with resin cements. 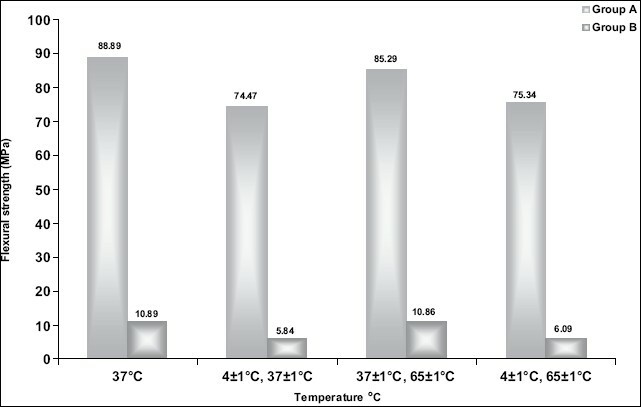 Laminate veneer specimens luted with resin cement and subjected to extremes of temperature, 4 ± 1°C and 37 ± 1°C and 4 ± 1°C and 65 ± 1°C, showed a marked decrease in flexural strength. After thermocycling at extremes of temperature, laminate veneer specimens luted with resin cement showed crack propagation. Fit of laminate veneers cannot/should not be compensated by the thickness of luting agent. The resin cement used for luting porcelain laminate veneer actually decreases the flexural strength and causes crack propagation in the laminate veneer. During the laboratory phase of porcelain laminate veneer fabrication, the die spacer must be applied carefully to form a uniform layer. This is to avoid excessive thickness of the luting cement that would reduce the ceramic and luting cement ratio. Tooth reduction must be sufficient to ensure uniform ceramic thickness in the final restoration that would provide favorable ceramic and luting cement ratios. I hereby acknowledge Dr. Chandrasekaran Nair, Professor, Dept. of Prosthodontics, Maruti dental college, Bangalore, for his valuable suggestions during the course of study. 1. Addison O, Fleming GJ, Marquis PM. The effect of thermocycling on the strength of porcelain laminate veneers. Dent Mat 2003;19:291-7. 2. Magne P, Med D, Kwon K, Belser UC, Hodges JS, Douglas WH. Crack Propensity of porcelain laminate veneers: A simulated operatory evaluation. J Prosthet Dent 1999;81:327-34. 5. Bona AD, Anusavice KJ, Dehoff PH. Weibull analysis and flexural strength of hot pressed core and veneered ceramic structures. Dent Mat 2003;19:662-9. 6. White SN, Zhan XY, Yu Z, Li ZC, Kipnis V. Cyclic mechanical fatigue of a feldspathic dental porcelain. Int J Prosthodont 1995;8:413-20. 7. Edge MJ, Wagner WC. Surface cracking identified in polished and self-glazed dental porcelain. J Prosthod 1994;3:130-3. 8. Giordano RA, Cima M, Pober R. Effect of surface finish on the flexural strength of feldspathic and aluminous dental ceramics. Int J Prosthodont 1995;8:311-9. 9. Giordano RA, Campbell S, Pober R. Flexural strength of feldspathic porcelain treated with ion exchange, over glaze and polishing. J Prosthet Dent 1994;71:468-547. 10. Chu FC, Frankel N, Roger, Smales J. Surface roughness and flexural strength of self-glazed, polished, and reglazed In-Ceram/ Vitadur Alpha porcelain laminates. Int J Prosthodont 2000;13:66-71. 11. Palmer DS, Barco MT, Billy EJ. Temperature extremes produced orally by hot and cold liquids. J Prosthet Dent 1992;67;325-7. 12. Brien WJ. Dental materials and these selection. 2 nd ed. Quintessence Publishing Company; 1997. 13. White SN. Mechanical fatigue of a feldspathic dental porcelain. Dent Mat 1993;9:260-4. 14. Isgro G, Pallav P, Zel JM, Feilzer AJ. The influence of the veneering porcelain and different surface treatments on the biaxial flexural strength of a heat-pressed ceramic. J Prosthet Dent 2003;90:465-73. 15. Sherhri SA, Mohammed H, Wilson CA. Influence of lamination on the flexural strength of a castable glass ceramic. J Prosthet Dent 1996;76:23-8.